Gilmer’s 2018 signees into the REACH program, pictured here from left to right, (front) Emma Bell, Ben Becerra, Naydelin Ajiataz-Arreaga, (back) Annalyssa Brown, Candelaria Raymundo-Bautista, and Alba Monraga-Telles. EAST ELLIJAY, Ga. – The Gilmer County Board of Education celebrated on Friday, October 19, to welcome its six new students into the Gilmer County REACH (Realizing Educational Achievement Can Happen) Scholars Program. 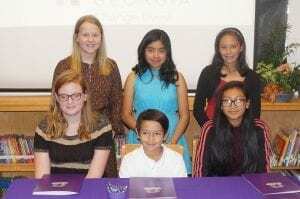 The six 8th graders were hosted at Clear Creek Middle School with a ceremony for their signing of the program agreement in the presence of the Gilmer County Charter School Superintendent Dr. Shanna Downs, Georgia Speaker of the House David Ralston, and Chris Green of the Georgia Student Finance Commission. The six students included Naydelin Ajiataz-Arreaga, Ben Becerra, Emma Bell, Annalysa Brown, Candelaria Raymundo-Bautista, and Alba Monraga-Telles. Each student celebrated the day with family members and member of the community in concerted agreement of support and encouragement for their years in high school and their plans beyond. David Ralston speaks at Gilmer’s 2018 REACH Signing Ceremony. 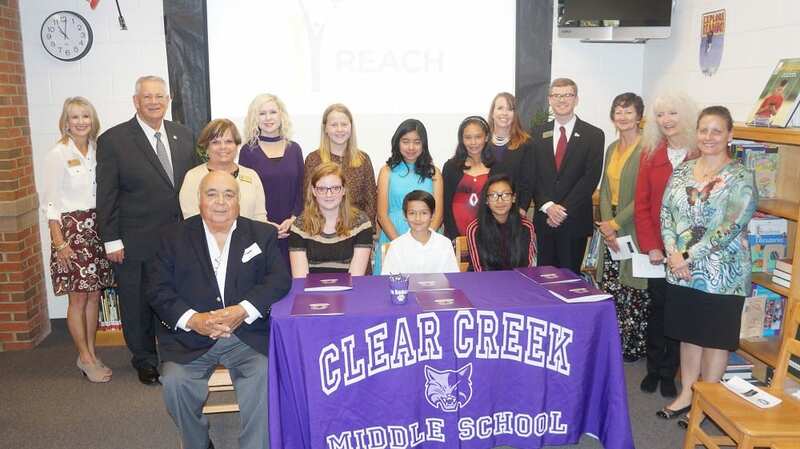 REACH Georiga is a needs-based scholarship that begins in 8th grade. REACH Scholars are paired with a mentor and an academic coach throughout high school. Scholars must maintain good grades with a 2.5 GPA in core courses, good behavior, and good attendance throughout their remaining middle school and high school years. Scholars who successfully complete the program and graduate from high school are awarded a $10,000 scholarship that can be used at HOPE-eligible institutions in Georgia. Chris Green, Georgia Student Finance Commission, speaks to Gilmer Students signing into the 2018 REACH Program. 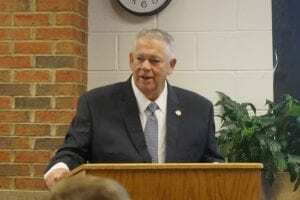 He continued to thank the students and schools for their work in the program saying the ceremony reaffirmed the commitment to education and seeing every student succeed. He also noted the states full funding for Georgia’s QBE (Quality Basic Education) program and increases in the state budget for securing our schools. 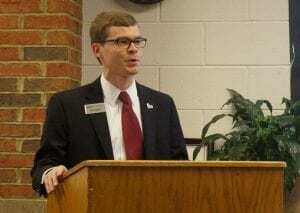 He also spoke to the student’s futures noting the state’s financial contributions to the new campus. “A dream come true,” as Ralston called it during their groundbreaking ceremony according to UNG. Green added to the sentiment as he noted the HOPE Scholarship program has already awarded over $10 billion to over 1.8 million students in its 25 years. As the REACH program follows those eligible institutions, Green asserted the commission’s efforts to spread the program to every school in the state. Congratulating Gilmer’s Scholars on their signing ceremony, he said he was proud to partner with the schools as the commission pursues its mission to help every Georgian to access post-secondary education. Make sure to check out more photos of the signing ceremony at FYN’s Facebook Photo Album.